UNITED NATIONS, December 19 -- On a day when outgoing UN Secretary-General Kofi Annan twice inveighed against the press focusing on acknowledged "bad apples" within the UN, rather than on the UN's laudable goals, we will focus this column on another interlocutor at the Kofi Annan farewell ceremony: the UN Development Program's until-recently head of human resources, Brian Gleeson. Mr. Gleeson approached accompanied by his daughter Paula, who was filming. Hands were shaken. We will emphasize in this account Mr. Gleeson's responses because he has a right to them, and we have been eager to receive and report them. But first, to set the stage, with Mr. Annan said. There is much to be said about this response, which Mr. Annan repeated, unprompted, at his farewell to the staff in the UN Cafeteria later in the day (click here for Inner City Press' wider UN Headquarters story on that). As to the statement that he is unaware of the "specific issues" about UNDP's policy of not providing copies of audits to any members states that ask (as even the Secretariat does), but only summaries of audits to those on its executive board, this series has laid these differences out, and UNDP Number Two Ad Melkert last week acknowledged the difference and that it should be fixed. The above concerned UNDP's funding of a plan involving disarmament in Karamoja, where soon the Ugandan army was killing women and children in the name of disarmament, as decried by the UN's own Louise Arbour. In June 2006, Mr. Annan stated he didn't know about these UNDP issues. On wider UNDP issues in December 2006, a similar answer. Is it time for more hands-on? Some say so. Particularly when it comes to reaching across First Avenue to hold UNDP to account. On a momentarily lighter note, at Mr. Annan's farewell to staff on Tuesday in the UN cafeteria, the UNDP representative who spoke waxed on about democratization in Latin America, legal and regulatory frameworks in Eastern Europe, and Liberia, making reference to "a little hiccup here and there." Afterwards the M.C. said UNDP is always so formal. On the issue of treating UN staff fairly, there is much to be said. Most of the sources for this series are UN and UNDP staff. There are many talented staffers who could do more to help the world than their supervisors, sometimes cronies and yes, sometimes abusive, allow. So to not inquire into these problems is not a favor to staff -- quite the opposite. That said, from the beginning of this series we have said we wanted to hear more from Brian Gleeson. This series began with a fast-written piece on November 29 about the sudden re-assignment of Mr. Gleeson, announced in a mid-afternoon email from UNDP Administrator Kemal Dervis. Even before Mr. Dervis' email went out, Inner City Press was contacted by sources with detailed accounts of events in UNDP that morning, and with differing versions of the grounds for Mr. Gleeson's re-assignment. Inner City Press contacted UNDP's Communications Office seeking explanation. Receiving none, Inner City Press called Mr. Gleeson's telephone line and left a detailed message with his secretary seeking comment. Since then, as different theories explaining the sudden re-assignment have emerged, all efforts have to made to inquire into the theories and seek comment on them. (Some requests for comment have been met with the less-than-helpful statement, "You are a jerk," the speaker of which was also in the UN cafeteria on Tuesday, walking proudly right between Mr. Annan, even stopping to take his picture. He was aloof and behind security guards, unlike Mr. Gleeson. When Mr. Gleeson approached, Inner City Press asked, can you explain why you were re-assigned? Alongside the theories we've reported, we've heard that you were investigating some employment problems within Nora Lustig's Poverty Group and refused to stop investigating and then were re-assigned. Mr. Gleeson declined to comment on the record. Inner City Press expressed regret that stories must be written quickly, the evening after the event reported on, even if requested comments have not yet been received (and on some issues, have still not been received, on the record). We do wish to quote this comment: "I've done nothing wrong," Mr. Gleeson said. "I hold my head high." Mr. Gleeson stated, as to some of the events at UNDP-Vietnam on which Inner City Press has reported, that he wasn't the head of Human Resources at the time. Point taken. Mr. Gleeson also said, I see what you're doing, and I agree with most of it, Mr. Gleeson said, referring for example to the call for broader availability of audits of UNDP. Mr. Gleeson said he'd seen the Secretary-General's press conference earlier in the day. He indicated that there should be accountability and transparency. We hope to have yet more to say of Mr. Gleeson. This UNDP series is continuing. 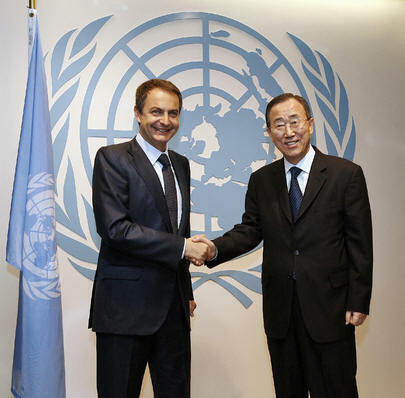 UNITED NATIONS, December 18 -- The failure of the UN Development Program to provide copies of its audits, even to the 36 countries which serve on its Executive Board, was raised on Monday to Spanish president Jose Luis Rodriguez Zapatero. Spain had just announced a major fund with UNDP, in a photo-op with UNDP Administrator at which no questions were allowed. Inner City Press asked about transparency, and bringing UNDP at least in line with the rest of the UN system in terms of providing full copies of audits. Video here, from minute 11:57. 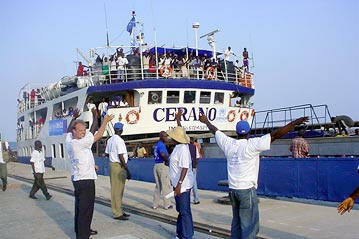 Spain in 2007 is on UNDP's Executive Board. "In the management of public funds, transparency must be a constant demand," Spanish president Zapatero said. "Of course the government of Spain, as an active contributor to UN programs, always wants maximum transparency... That is fundamental." Therefore it would appear that at the upcoming UNDP Executive Board meetings beginning January 19, 2007, Spain will be looking for a change in UNDP policies -- or demanding such changes, if they have not by then been formally proposed by the Dervis - Melkert regime at UNDP. "Responding to a reporter's questions on the lack of availability and detail of UNDP audits and the reported difficulty in getting media requests answered by the agency, Mr. Melkert said any report that he had told staff not to talk to the press was 'absolutely totally ludicrous.' But he added he would like the agency's transparency level to reach wider UN standards. 'Talking about transparency, the best criterion for me is my own transparency - I'd like to bring our procedures in line with the UN procedures, I think that should be normal, so I'm looking into that at this moment,' he said." Kemal Dervis appears for a press conference on December 21 and well might be expected to commit himself on this issue, even in his opening statement so that questions can be asked on other, also-pressing matters. "Inadequate oversight of the MCC, which at that time was chaired by the current Deputy Secretary-General, to ensure financial disclipline and respond to management failures as evidenced in the audit reports [of 2004, A/59/5/Add.10, Supp. No. 5J, etc. ]....The executive board has been generally vague on any specific measures to address structural and systemic problems of UNOPS. There was no follow-up on the Staff Council's request to the OIOS on management and waste of financial resources...UNOPS staff are not considered as internal candidates at UNDP and other agencies in New York. Affected General-Service staff holding a G-4 visa and unsuccessful in seeking employment within 30 days after the end of their contract, will be required to relocate to their home country." UNITED NATIONS, December 15 -- "I'd like to bring our transparency in line with the UN procedure", the Associate Administrator of the UN Development Program, Ad Melkert, answered Inner City Press on Friday. This answer came after UNDP had refused to provide copies or even summaries of audits of its admittedly troubled Russian Federation office, and after Inner City Press pointed out that the UN Secretariat at least provides full copies to any of the 192 member states which make a request. Mr. Melkert added, "That should be normal... Talking about transparency, the best criteria for me is my own transparency.. I'm looking into that right now." Video here, from Minute 45:46. Inner City Press inquired into a meeting Mr. Melkert held on December 1 with the staff of UNDP's Poverty Group, concerning steps taken to quickly bring Jeffrey Sachs' team from the UN Millennium Group onto the UNDP payroll. Having just referred to transparency, Mr. Melkert nevertheless began with the "hope you are not going to ask me about all the meeting that I've had." He continued that "for this exception case, yes, this First December meeting, I was... It was a managerial decision to merge, it's my responsibility, everybody can and should work with that. With respect to staff rules, we have tried to make the best out of that." While confirming much of what Inner City Press sources have said about the meeting, Mr. Melkert denied that he has told staff not to speak to the press. Time will tell. 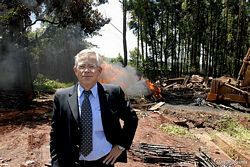 Mr. Melkert claimed that UNDP never funded disarmament in Uganda, only "community development." Rather than naming Karamoja, the region in Eastern Uganda in which the program was funded, Mr. Melkert apparently confused it with the Lord's Resistance Army-impacted area he called "Northern Uganda," where he said it is "hard to distinguish from the situation of risk and potential conflict including the roles weapons play." Video here, from Minute 36:25. But William Orme, previously of UNDP's Communications Office, said earlier in the year there was a voluntary disarmament component, and UNDP in Uganda issued a press release announcing the suspension of funding. When the seeming dissembling spreads to the Number Two in the agency, the plot thickens. What will the often invisible Number One, Kemal Dervis, have to say? While his December 18 appearance has been cancelled, Inner City Press was again told on Friday that he will appear on December 21. He can be expected to be asked to spell out UNDP's plan for greater transparency, among other things. "On UNDP's Russia office: Three Resident Representatives have headed the UNDP Country Office (CO) in the Russian Federation since it began operations in 1997. Philippe Elghouayel served from August 1997 until January 2001. Frederick Lyons served from March 2001 until April 2003. Stefan Vassilev served as acting Resident Representative from April until June 2003, and then as Resident Representative from September 2003 until August 2005. A full internal UNDP audit of the Russia Country Office was conducted in August 2001. This cited numerous shortcomings and gave the CO an overall rating of "deficient." A follow-up partial audit was conducted in September 2003. This noted improvement in many areas and issued a rating of "partially satisfactory." The discovery of suspected fraudulent activity triggered an internal investigation in June 2005. This investigation concluded that one payment amounting to $190,000 was fraudulent. Additional payments that could be fraudulent were under investigation. Three former UNDP staff members, all locally employed Russian nationals, were implicated in the fraud. All three resigned from the Country Office before the investigation was launched. When the extent of the fraud became evident, Mr. Vassilev was summoned to headquarters. He was removed from his post in August 2005 and subjected to disciplinary proceedings stemming from shortcomings in management performance and oversight. Mr. Vassilev is no longer employed by UNDP. In September 2005, drawing on the evidence collected in the investigation, the UNDP Administrator made an official request to Russian law enforcement authorities to open a criminal investigation into the fraud. Such an investigation was opened by the Moscow Prosecutor and is currently under way, with UNDP's active cooperation. UNDP informed its Executive Board of the fraud, as part of its regular reporting processes. In the wake of the special audit and rigorous internal reviews, UNDP has undertaken a painstaking restructuring of its finance operations and management structure, enacting the recommendations both of UNDP auditors and of a regular UN Board of Auditors audit conducted early in 2006. In addition, oversight roles and functions have been carefully reviewed at Headquarters, and fresh efforts have been devoted to ensuring that audit recommendations are heeded. To support these corrective efforts, UNDP has assigned some of its most experienced staff to the Russia CO. Ercan Murat, a UNDP veteran who had served previously as Resident Representative in Azerbaijan, the Kyrgyz Republic, and Afghanistan, came out of retirement to serve as acting Resident Representative in Russia from September 2005 until September 2006. Marco Borsotti, who currently serves as UNDP Resident Representative in Azerbaijan, has received clearance from the Russian Government and is expected to take up his post as the new Resident Representative in January 2007. The effectiveness of UNDP's corrective measures was recently confirmed through an independent external review which judged the management practices of the Russia CO to be fundamentally sound and in line with UNDP regulations and standards." There. Some of the things not yet addressed are the Brussels funding for the Moscow planetarium project, as well as the other requested audits concerning Honduras, Afghanistan and the Private Sector Unit of the Bureau of Resources and Strategic Partnerships. There is also the reference to "receiv[ing] clearance from the Russian Government," more on which anon. "Dear Matthew, regarding the allegations relating to the Bratislava Regional Centre... Ben Slay has not collected any improper daily sustenance allowance at any time. We find no suggestion that his predecessor did, either, but because his tenure ended some time ago, we are pulling additional records out of storage to confirm this. The Vienna office you appear to be making reference to opened before Ben Slay even arrived as Director of the Bratislava Centre. Ben Slay sometimes works from the Vienna office. He does not collect DSA for doing so. "